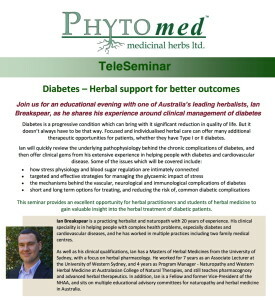 Next Tuesday 21st October I’ll be conducting a teleseminar on diabetes, for New Zealand herbalists and naturopaths. 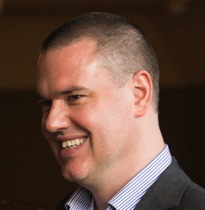 Hosted by the New Zealand company Phytomed, the title is “Diabetes – Herbal Support for Better Outcomes”. A major focus of my presentation will be how stress physiology plays a significant role in blood sugar regulation, and how – with the correct choice of specific herbal medicines – you can attenuate the hyperglycaemic response and improve long term glycaemic balance. In addition I’ll be discussing the pathophysiology of chronic diabetic complications, and how certain herbal medicines can reduce the risk and severity of these complications. I’ll also be giving clinical examples of how progress can be effectively monitored, and present a classic case study from my own clinical practice. If you are a New Zealand herbalist or naturopath, I look forward to speaking with you next Tuesday evening.